It’s called “walking down the grain,” it’s illegal and it results in suffocation deaths on farms with frightening regularity. It refers to the practice of workers going into grain silos and bins with shovels and picks to break up clogs in the grain so that it can flow smoothly. It’s a highly dangerous practice that can result in sudden entrapment similar to being sucked in by quicksand. It can happen in less than a minute. This summer is starting as many others, with a lone worker trapped and suffocated in a grain silo – his would be rescuers talk about futile attempts to save him. News reports say that he fell in – until OSHA investigations, we may not know the particulars around why he entered the bin alone and had no protection, such as harnesses. Sometimes farmers do this on their own. Sometimes, they send workers in to walk down the grain – often teens, immigrants or some other temporary workers who may not be aware of the dangers. That was the case in 2010 when a 20 year old and two teens were entrapped in an Indiana silo. One teen survived. 2010 was a year for the record books. Heavy rains the prior year made for very moist, clumpy grain in storage. Twenty-six people died in that year, the worst year in decades. “At least 498 people have suffocated in grain bins since 1964, according to data analyzed for the Center and NPR by William Field, a professor of agricultural and biological engineering at Purdue University. It should be noted that these are reported incidents. 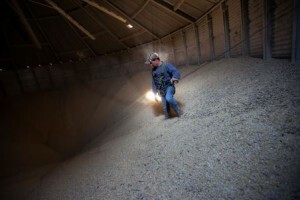 This spring, the Center for Public Integrity and NPR produced a special investigative series called Buried in Grain. In a recorded segment, the sole survivor of the Indiana grain bin entrapment recounts the experience, a gripping and powerful account. The first segment also talks about another dangerous practice: how almost all the fines levied by OSHA in such fatalities wind up being slashed in what might be termed “walking down the fines.” In subsequent reports, the series talks about why storage bin rescues are so risky and complex, and a third offers prevention strategies. Liz Borowski of The Pump Handle links to various other news reports and resources on grain bins and temporary workers. The Pump Handle, an excellent blog that reports on public health and policy issues, has been great in keeping attention on this subject. We also point you to the powerful video on Grain Bin Safety issued by The National Corn Growers Association and the National Grain and Feed Foundation, previously posted here. Farming is a dangerous livelihood. Storage facilities present many other dangers. A year after the deaths discussed in the above report, we posted about two teens who both lost legs in a grain bin augur accident. 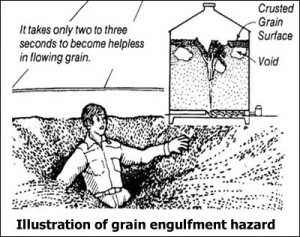 Other grain storage hazards beyond engulfment and suffocation or being caught in machinery include lung disease and poisoning from fumigants, mold, and grain dust. Plus, the risk of explosions from combustible dust: this year has seen at least two deaths related to a grain bin explosion in Indiana. OSHA has put bin operators on notice and provides a variety of tools and resources about grain handling safety. Many are cynical, however, that with weak enforcement and continued “walking down the fines” the practice of “walking down the grain” won’t go away any time soon. This entry was posted on Tuesday, July 2nd, 2013 at 1:03 pm	and is filed under Safety & Health. You can follow any responses to this entry through the RSS 2.0 feed. You can skip to the end and leave a response. Pinging is currently not allowed.